100 g Styrian Pumpkin Seed Oil P.G.I. Grease the cake tin and coat with bread crumbs, preheat the oven to 175°C. Separate the eggs, beat the egg whites with some sugar until it forms stiff peaks. Beat the egg yolks with the rest of the sugar, the vanilla sugar until creamy. Stir in the Styrian Pumpkin Seed Oil P.G.I. and the lemon juice. In a mixing bowl, blend the flour, baking powder and ground pumpkin seeds. Add the beaten egg whites and the dry ingredients with the egg yolk mixture alternately. Pour the batter into the cake tin and bake at 175°C for approximately one hour. Turn the cake over and let cool. 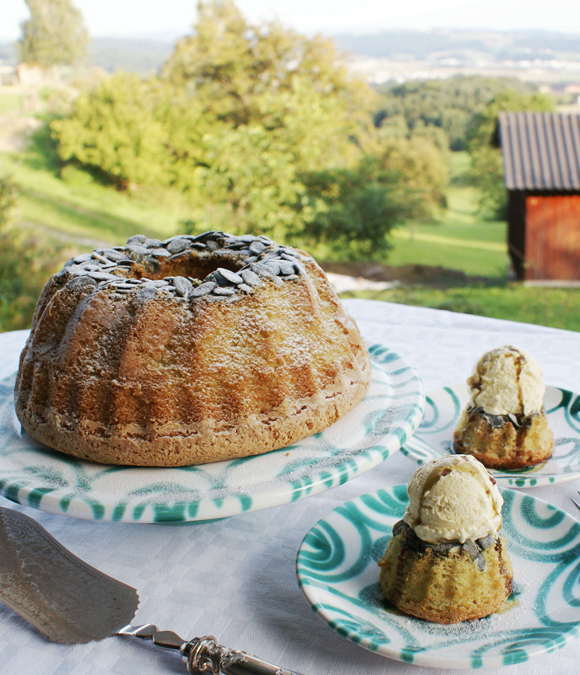 For the icing whip the egg yolks with confectioner’s sugar and glaze the cake with it, sprinkle with ground Styrian pumpkin seeds and keep cool. Tip: Instead of using a yolk icing, just sprinkle the cake with confectioner’s sugar.